The Caribbean island of Dominica is a natural treasure. Visitors will find a medley of brooding volcanic peaks, gushing mountain streams, dense forests, quiet lakes and spouting geysers. As you might have already guessed, it's a diverse and beautiful land. Given its natural assets and warm and welcoming locals, Dominica should be a bustling tourism hotspot. Despite being one of the poorest in the region, crime is relatively low. But a marked lack of pumping nightlife, no direct flights to Dominica from the UK and little in the way of sandy beaches all mean it remains off the radar for many travellers. And yet this is what makes the island so appealing for the intrepid few. Those partial to hiking amid thick tropical rainforest and gazing at bubbling lakes, will find this sunny green isle has many charms. 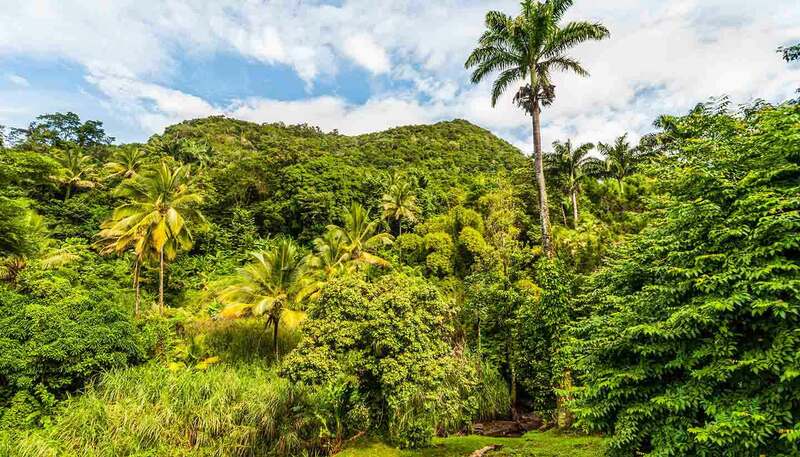 In fact, much of Dominica is the domain of sprawling jungle, making it ideal for trekking. Adventuring your way around Dominica's natural delights is very much a primordial experience. On your travels through red mud trails and over undulating volcanic slopes, you'll find thundering waterfalls, hot springs where you can let nature heal your aches and pains, and even swim through a narrow gorge. Explore colourful coral reef with your snorkelling gear, be buoyed by bubbling volcanic water and visit the rawest spas imaginable – Dominica has so much to offer. Perhaps the most attractive thing about the island, though, is the very thing that keeps the hordes away. Dominica has avoided mass tourism, and as a haven where Mother Nature is in charge, unspoilt by human hands. Having been both a French and British colony, the 70,000 or so inhabitants have various roots, including the indigenous Caribs, though the people are largely African in origin. As for visitors, they see Dominica as an unblemished alternative to the more commercial Caribbean islands. Here you can get away from the crowds, welcomed by the friendliest of local populations. 751 sq km (290 sq miles). President Charles Savarin since 2013. Prime Minister Roosevelt Skerrit since 2004. The hurricane season in the Caribbean normally runs from June to November. You should monitor local and international weather updates from the US National Hurricane Center and follow the advice of local authorities, including any evacuation orders. Hurricane Maria passed over Dominica on 19 September 2017, causing widespread damage to communications, buildings and infrastructure. Life in Dominica continues to return to a state of normality. Mains water has been restored to 85% of the population, and bottled water and communal tanks are available. Electricity has been restored to Roseau and Portsmouth, and for all essential services. Local communications and access are improving, and public and private sector businesses have reopened. All main roads in Dominica have been cleared, although heightened care is needed when navigating some roads affected by the hurricane. Commercial flights are operating from the airport and ferry options are also available. While many hotels have reopened, and the number of serviceable rooms continues to increase, demand remains high, so if you’re considering travelling to Dominica, you should make firm arrangements for accommodation in advance. If you’re in Dominica, you should continue to exercise caution and follow the advice of the local authorities. Consular support may be limited in Dominica as there is no British High Commission office. However, the British High Commission in Bridgetown, Barbados, can provide consular support. UK health authorities have classified Dominica as having a risk of Zika virus transmission. For more information and advice, visit the website of the National Travel Health Network and Centre website. Although there’s no recent history of terrorism in Dominica, attacks can’t be ruled out. Most visits are trouble-free but incidents of crime do occur. Many roads were damaged during the passage of Hurricane Maria in September 2017. While most have reopened, extreme and heightened care is needed when navigating some areas. Take care when driving on the main road from Douglas Charles airport. This is prone to landslides following bad weather and has a number of sheer drops where the road has fallen away. Avoid driving on this road at night. Road signs are limited and a map is essential. Public transport is available at a cheaper rate. Minibus drivers might drive above the speed limit. There are severe penalties for all drug offences. Pack all luggage yourself and don’t carry anything through Customs for anyone else. It is an offence for anyone, including children, to dress in camouflage clothing. Be aware of local dress codes and don’t wear swimming attire when walking in town. British Passport holders don’t need a visa to visit Dominica. On entry, you will be granted a specified period to stay. If you wish to stay longer, you must apply and pay for an extension of stay through the Dominica Immigration Department. Your passport should be valid for the proposed duration of your stay. UK Emergency Travel Documents are accepted for entry, airside transit and exit from Dominica. Entry requirements may change from time to time. You should check with the Office of the High Commissioner for the Commonwealth of Dominica before you travel. You’ll have to pay a departure tax of 59 East Caribbean Dollars (for each traveller aged 12 years or older). The equivalent in US dollars ($23) is accepted. Cases of Chikungunya virus have been confirmed in Dominica. You should take steps to avoid being bitten by mosquitoes. Medical treatment in Dominica can be expensive. If you need emergency medical assistance during your trip, dial 999 and ask for an ambulance. You should contact your insurance/medical assistance company promptly if you are referred to a medical facility for treatment. Before choosing to be treated at a private facility, you should check their policies on pre-payment. Private clinics may not accept medical travel insurance as payment for treatment.